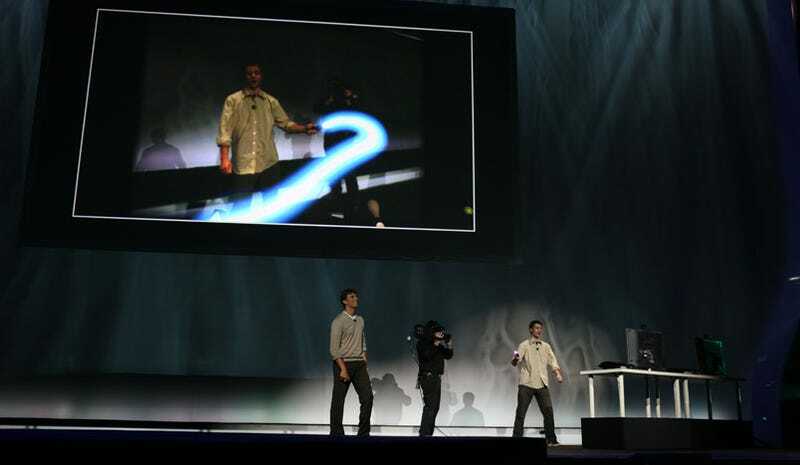 Sony Computer Entertainment reached out to its development partners today, getting them up to speed on the new PlayStation Eye-powered motion controller tech it showcased at E3 2009. It also expanded upon the details provided at the show. The PlayStation 3's second motion control push is slated to launch in Spring 2010, Sony Computer Entertainment reiterated to developers today, arriving with a "range of first-party and third-party content." SCE pitched the new controller as capable of functioning "with any games across all genres from casual to core." On the technical side, SCE says that the PlayStation Eye accessory will come equipped with force feedback rumble. Sony boasts that the "face-tracking and head-tracking capability already in the PS3 SDK" will offer developers "powerful tools for new types of user interaction." Sony says its new controller will also work in tandem with the Eye's built-in microphone array for voice input and voice recognition. Up to four of the new motion controllers can be tracked at once by the PlayStation Eye. Adding the wand controller to games comes at a horsepower cost, Sony notes, writing that the "motion-tracking library has some SPU overhead and has an impact on memory as well, although these will be minimized." The developer targeted communication also indicates that Sony is "currently looking into the possibility" of combining motion control wand and stock PS3 controller functions, offering the example of "the motion controller as a sword and use DualShock 3 as a shield." Sony did not express a price, firm launch date or plans to bundle the PlayStation Eye motion control accessory.